Fresh from their silver medal achievement at the World Cup in London, the celebrations are continuing for the Irish women's hockey team. The humble heroines made sure that one of their first stops was at Our Lady's Children's Hospital, Crumlin, where they met some of their youngest fans yesterday. The team made the trip after their homecoming on Monday, which saw the capital's Dame Street grind to a halt as huge crowds turned out to show their gratitude to the team following their performance in the competition. Despite being underdogs, Ireland made it all the way to Sunday's final, which proved a bridge too far as they were beaten 6-0 by the Netherlands - the leading force in women's hockey. Among the youngsters who had their day made when some of their hockey heroes visited Our Lady's was seven-year-old Millie O'Mahony, from Kinsale. 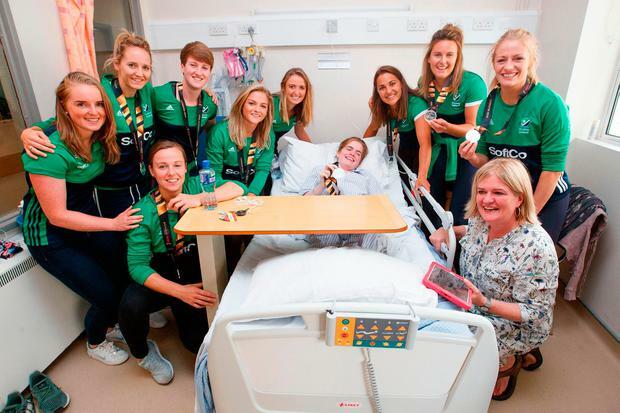 Katie Smith (12), from Kildare, beamed as she tried on the World Cup silver medal during her meeting with the players - including Emily Beatty - while Eadba Ni Chathasaigh and her mother, Lisa Ni Larliathe, were also over the moon to meet the team. It has been a busy few days for the hockey stars who touched down in Dublin Airport on Monday before making their way to a raucous homecoming, which saw a massive crowd snake along Dame Street from George's Street to the front of City Hall. Roisin Upton, Naomi Carroll and Yvonne O’Byrne with Millie O’Mahony (7).